The Hunter green Stealth Stalker 10 is a new kind of fishing boat equipped for use in various fishing conditions.. on rivers, lakes, bays..in calm or rough weather. Comfortable for two, easily handled by one! this roomy, portable, light weight boat features a fully enclosed hull for use on almost any body of water. Wide sectional floorboards provide plenty of fishing space and a conveniently located stow bag makes for easy access. The new Hunter green Stealth Stalker 10 is a stealthy inflatable boat that’s perfect for fishing or hunting. Lightweight and portable it goes anywhere and sets up in under 15 minutes! utilizing a round-hull configuration with an inside cockpit this enclosed boat gives anglers a safe secure feeling while fishing in calm or rough seas. A truly stable and functional fishing Craft that can be used in a wide range of fishing and water conditions. Plus.. a three year warranty! all our Sea Eagle boats are covered for a full three years against manufacturer’s defects.. from bow to stern. Stealth Stalker 10 Pro package: designed for the pros, featuring two removable 360 degree swivel seats on 7 inch pedestals, 4 universal Scotty mount pads, 4 universal Scotty deck mounts, 4 Scotty rod holders and a motor mount. Standard features: NMMA certified new Hunter green color full fabric floor 3 carry handles 4 built in universal Scotty mount pads motor mount receiving brackets canopy receiving brackets raised oarlocks for better rowing marine plywood floorboards provide standing stability and hull rigidity, aluminum h-bar and side struts included printed instructions. Sea Eagle’s Frameless Fishing Boats are roomy, lightweight, ultra-portable, pack into a small bag, and can be stowed in small spaces. Great for lakes, rivers, bays, creeks or almost any body of water the Sea Eagle Frameless Fishing Boats will take you where you want to go and where most other boats wouldn’t dare! Because they have no frames they pack down small and light and because they don’t require a trailer you can carry them to the most remote hard to reach locations where fish hide most! Large air chambers allow these Frameless Fishing Boats to support an incredible amount of weight yet draft as little as 4 inches of water. Meaning you have access to shallower waters where heavier boats don’t! Because they are equipped with universal Scotty Mounts, you can customize these Frameless Fishing Boats as you wish! Outfit them with multiple rod holders, sounder mount, anchor lock, running lights, bait board or cup holders. The Pro Package has the super comfortable swivel seat, floorboard, motor mount, a stripping apron, clip on stow pouch and side/stern bag, plus 2 Scotty Rod Holders. Perfect for the fisherman that already has his own motor. 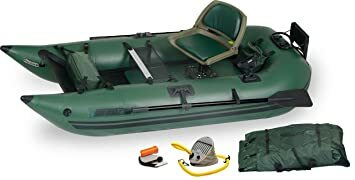 Also includes AB285 oars, Quick Release Seatmount, 7″ pedestal, A41 Foot pump, Boat Carry Bag, Repair Kit, Instructions, and 3 Year Manufacturers Warranty. Everything about the SE330 is easy. Easy to carry, easy to inflate, easy to paddle, maintain, deflate and AFFORD! The SE330 is made with an extra-thick 33 mil K-80 Polykrylar hull. It weighs just 26 pounds, but will carry 500 pounds. It’s inflated dimension are 11’2″ x 2’10” Between it’s 9″ tubes is a 9’6″ x 1’1″ interior. It inflates from it’s compact 24″x16″x7″ deflated size in only 6 minutes with the included foot pump. It is suitable for up to Class III whitewater. If you’re looking for a kayak that can hold 2 people plus camping gear for a week, this is it. It is made for the most-demanding situations where you need to be able to pack-in a lot of gear. 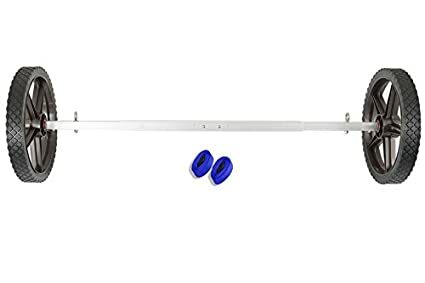 This simple to use and easy to assemble cart wheel system fits under our Sea Eagle Kayaks, PaddleSki, 285FPB, and 375FC FoldCat. It allows you to roll your Sea Eagle from where you inflated it to where you launch it. Packs down for easy transport. Not recommended for our heaviest boats or with boats carrying an 8 or more horse power engine. Weight limit 125 lbs. Wheel diameter 14″ x 2″ wide. These are not meant to be used as a trailer or with a vehicle. Can be used with many other inflatable boats other than Sea Eagle as well. includes two Straps. Works with 285fpb Frameless Fishing Boat and 375fc FoldCat. Pontoon boats are a great way to get to places where fish are hiding, but who’s got 35- to 40 minutes to put a boat together like required for most tubular frame pontoon boats. The FoldCat375fc has a unique folding support system that can be inflated and assembled in 5 minutes by one person. The FoldCat 375fc will take upto a 3hp gas engine, but motors very well with a small electric motor. Two swivel seats allow you to turn the follow the fish wherever they swim. Unlike other pontoon boats with thin bladders inside of a heavy and porous outer bags, the Foldcat375fc features 1000 denier reinforces inflatable hull – just like the Sea Eagle Sport Boats that handle upto 40H.P. This boat weighs only 75-lbs, but has a whopping 2 person/650-lb capacity. 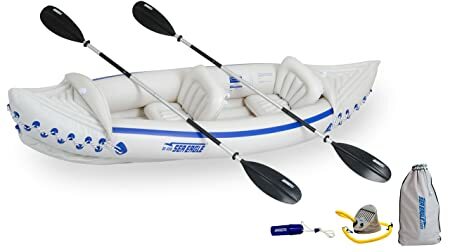 385FTK_D Sea Eagle Fast Track Inflatable Kayak with Deluxe Accessory Package, 12′ x 6"
The Sea Eagle 385ft FastTrack features a sharper, narrower, tapered bow for faster entry through wind, waves, current and water. Now with a new patented, state of the art, external, rigid, inflatable NeedleKnife Keel for a faster, smoother paddling experience! The unique external drop stitch construction inflatable keel allows the FastTrack to paddle far faster and straighter than other inflatable kayaks. The keel features sharp bow and stern molds that slice through wind, waves and current for a super fast, super clean entry and exit! The inflatable bow keel also provides the buoyancy and lift needed to ride over waves and further improve speed. The FastTrack’s sleek asymmetrical shape is tapered and narrow at the bow while being wider at the stern. This allows the FastTrack to punch through waves faster and easier because of the narrower bow while providing buoyancy where most needed – where 1 or 2 paddlers sit. The SE370 inflatable kayak packs down to fit in a storage bag, but has cargo space for camping supplies for several days. An inflatable kayak can be used for fishing, yacht tending or skin diving. For river runners, the Sea Eagle 370 can handle up to class three whitewater. In many ways, this is the easiest to use, the most versatile and the most fun inflatable kayak that we sell. 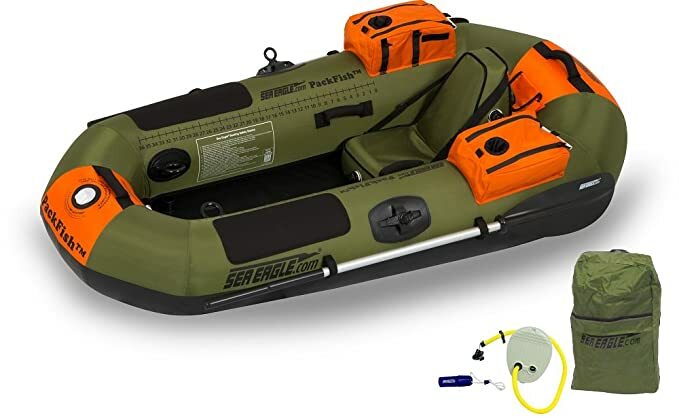 Sea Eagle Inflatable Motormount Boats are multi-purpose inflatables that can be used for fishing, yacht tending, mild whitewater rafting and general motoring or rowing around lakes and bays. Simple to use, simple to set up, lightweight and compact to carry or stow. These boats are many things to many people. The New Sea Eagle SE9 is now equipped with a higher pressure – up to 3 psi versus traditional less than 1 psi inflatable floor and seats that are removable, I-beam reinforced, and encased in their very own superior high strength protective nylon fabric sheath. This lightweight, affordable, inflatable fishing boat holds up to 4 people, is super stable and works great with small gas or electric motors! 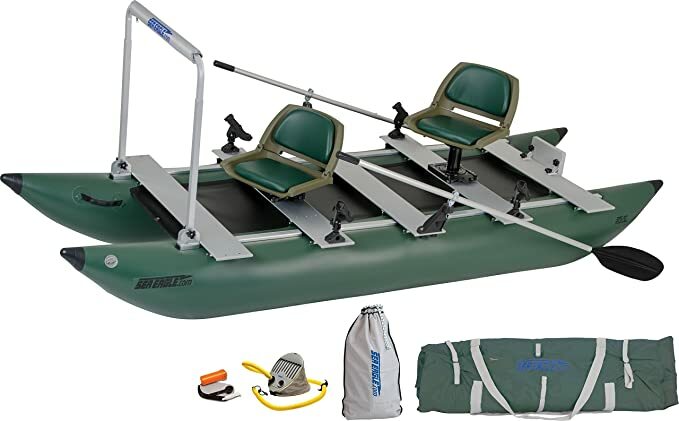 The Fisherman’s Dream Package includes: SE9 Hull, SE9 Inflatable Floor, SE9 Motormount, Foot Pump, AB254 oars, Carry Bag, 13″ High Fishing Inflatable Seat, 4″ High Rowing Inflatable Seat, Small Repair Kit, and Instructions.